If you’re aged 60-74 (or 50-74 in Scotland) and registered with a GP, you will be invited to take part in the NHS bowel cancer screening programme every two years. Taking part in screening is the best way to diagnose bowel cancer at an early stage. Nearly everyone diagnosed at the earliest stage will survive bowel cancer, but this drops significantly as the disease develops. Margaret Vance, Deputy Director of the London Bowel Cancer Screening Hub, helps us shed some light on how the screening programme works and what is involved in taking part. The screening test looks for the presence of blood in your poo that can’t normally be seen. Screening can help detect hidden blood which doesn’t normally show up on your toilet paper or toilet pan. These small amounts of blood could indicate that there is a polyp (non-cancerous growth) or cancer in your bowel. 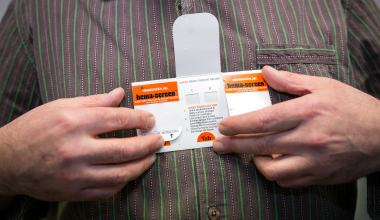 The test is very simple, you don’t have to handle any poo yourself , but use a sample stick to collect tiny samples to wipe on the special screening card. You will be sent detailed instructions with your kit. You send your completed kit to a laboratory in a hygienically sealed freepost envelope, where your samples will be tested. One of the great things about the bowel screening test is that you can do it in the comfort of your own home at a time that suits you. You collect three different samples of poo over two weeks (10 days in Scotland and Northern Ireland), so it makes sense to do this from home rather than having to visit your GP or a hospital. Most people who complete the test won’t have blood in their poo. If this happens you won’t need any more tests, but you should still see your GP if you are worried about any symptoms. Sometimes the result is unclear, so you might be asked to do the test again. If blood is found in your poo, you will be referred for an appointment with a specialist nurse who can explain the results and what happens next. You might need to have a colonoscopy, which is a test to examine the inside of your bowel. This doesn’t mean you definitely have cancer. Blood could be caused by a non-cancerous polyp or another health problem. No test is 100% accurate and not all bowel cancers or polyps will bleed. It is very important that if you are worried about any bowel symptoms or if things just don’t feel normal for you, you visit your GP for an assessment. Bowel symptoms could include bleeding from your bottom or blood in your poo, a change in bowel habit lasting three weeks or more, unexplained weight loss, extreme tiredness for no obvious reason or a pain or lump in your abdomen. If you have misplaced your kit, don’t think you’ve been sent one or would like any more information you can call the free bowel screening helpline. The helpline can also provide information in more accessible formats such as easy read, large print and different languages. Find more information about bowel screening here.